As preschoolers, Sydney, Colin and Anthony* all had speech difficulties. Sydney could tell delightful stories with animated gestures but very few words; Colin conversed well but couldn’t articulate the letter “r”; Anthony was verbal but only his parents could understand him. While experts agree children develop language at different rates, some speech patterns—including stuttering, autism, hearing loss and Down’s syndrome—do indicate problems. But how can parents know when their child needs help with less obvious language difficulties? They usually can’t without expert evaluation, acknowledges the American Speech-Language-Hearing Association on its Web site. The organization lists guidelines for speech development from birth through fifth grade, but cautions they are averages that not all normally progressing children will meet. In general, infants at three months will coo and smile, and at six months will babble in speech-like sounds and laugh. A one-year-old will speak a few short words and will understand names of common items. Two-year-olds begin to use two-word sentences, three-year-olds have a word for almost everything, and four-year-olds use sentences with four or more words. Kindergartners can communicate easily with detailed language and standard grammar. If your child deviates widely from the norm, experts urge you to have him or her evaluated as young as possible. “Early intervention is the key to preventing a lot of problems,” says Gena Wiskus, a speech-language pathologist with El Dorado County Office of Education who works in county schools. The younger the brain, the more easily it can be retrained. Speech therapy is provided through public schools and private therapists. School treatment is free for district residents ages 3 to 21, regardless of whether they’re enrolled in a district school. A pathologist evaluates each child, but, with limited budgets, schools can serve only the most “severely delayed,” Wiskus says. Private therapy is not inexpensive, but most therapists will work with families to keep costs reasonable. 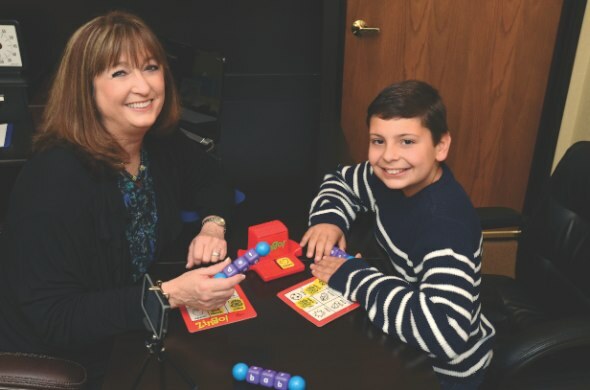 Nancy Barcal, a speech-language pathologist and owner of Granite Bay Speech, trains parents to work with children at home, which can shorten the treatment schedule. In her practice, she employs play therapy and gives her families “homework” that is bonding and fun. Whatever therapy the child receives, Barcal emphasizes, the most important criterion is that it be based on sound scientific research. Parents should ask how the therapist knows the treatment will achieve the promised results. Some children work with school and private therapists simultaneously. Sydney is one of those. The Fair Oaks second-grader has 30 minutes each week at school and additional sessions with Barcal. The two therapists work as a team to coordinate the child’s treatment. Sydney is an only child, and without other children for comparison, her parents weren’t sure how to interpret her language reticence. It was a neighbor who alerted the family that the four-year-old didn’t have the language proficiency of other kids her age. “She does a great job telling a story,” the neighbor told Sydney’s mother, “but she doesn’t actually say anything.” One of Sydney’s issues was too little muscle strength and coordination in her tongue, jaw and lips to pronounce some sounds correctly. In compensating for the sounds she couldn’t make, she developed other speech problems. After about three years of therapy, Sydney tests close to age level. Being unable to pronounce just one letter may not seem critical, but, as Colin’s mother points out, “the letter ‘r’ is pretty much in every word.” Plus, not being able to articulate an “r” affected other sounds. Embarrassed by his speech, Colin resisted speaking or reading aloud in class, hindering his performance in school. “Public speaking is really a life skill,” his mother says. “They start it in kindergarten.” Now a fifth-grader in Granite Bay, Colin began therapy in second grade, late by many standards. Treatment focused in part on retraining the way he places his tongue in his mouth. His mother is delighted with his progress. “He’s already starting to feel more confident,” she says. Anthony, a Rocklin sixth-grader, is a “clutterer.” Children who clutter talk in fast, often jumbled speech, frequently dropping words or parts of words. Anthony’s mother grew concerned when his brother, two years younger, surpassed Anthony in language mastery. Though his kindergarten teacher noticed Anthony was difficult to understand, he was not evaluated until third grade. Late to therapy, he also works with both the school pathologist and Barcal. The treatment is complex: teaching the child to slow down, articulate, organize his language, interact with listeners. Anthony is still in therapy but is now easily understood when he talks. Not all children with delayed speech need therapy. For example, says Dr. Raslear-Hendrickson, the youngest child who always lets older siblings speak for him often catches up in preschool, and a child in a bilingual home may be slower processing each language but will usually master both by kindergarten. *For privacy reasons, the families requested the children’s last names in this story be omitted.